Once you find an iPhone app that interests you in the iTunes App Store, you can find out more details about that particular app, as well as read reviews on it. To learn more about any app on any page, tap it, and a detail screen appears. 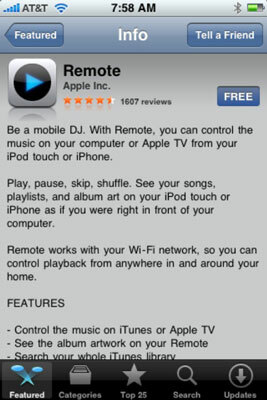 The detail screen for Remote, a free app from Apple that lets you control iTunes or AppleTV from your iPhone. Keep in mind that the app description on this screen was written by the developer and may be somewhat biased. Also, only the 17+ rating now appears on a detail page. The other age ratings (4+, 9+, and 12+) don’t appear. Scroll down to the bottom of any detail screen, and you find a star rating for that app. It’s also the link to that app’s reviews; tap it to see a page full of them. At the bottom of that page is another link called More Reviews. Tap it to see (what else?) more reviews.